Seems I was a bit too trigger happy to announce the release but since then, we had to revert it. The new one should be up again soon I hope. The things below still apply (minus the links ofc). 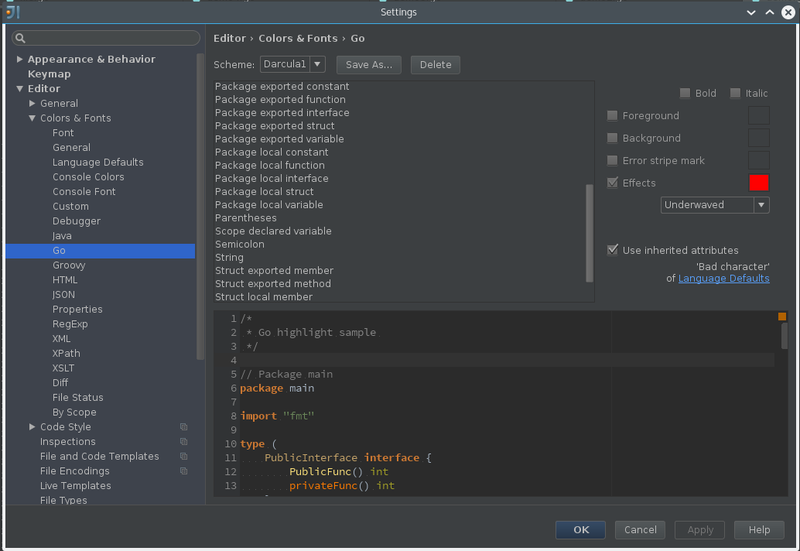 I'm happy to announce that the latest release of the Go plugin for IntelliJ IDEA 1.0.0.alpha#134 supports a high degree of customization for highlighting (among many other things). The release is available on the Github releases section (please read the docs before installing and install the zip file). Also, I'd like to address some questions about the "alpha state" of the plugin. Q: When will we have a stable, official release? A: When it's good enough for us and our users. Q: Should I install this at all? It has an alpha in it's name. A: No, at this point 1.0.0-alpha releases are in a much better state than the 0.9.x releases. Q: Is the plugin written in Go? Or can it be written in Go? Q: Can you include oracle, golint, gofmt or other tools? Q: Can you include X / Y / Z in the release? Or change A / B / C feature? A: It all depends on the issue or feature you are requesting. It also depends if we can find people to help with the implementation. Or if you want / can implement it yourself even better. 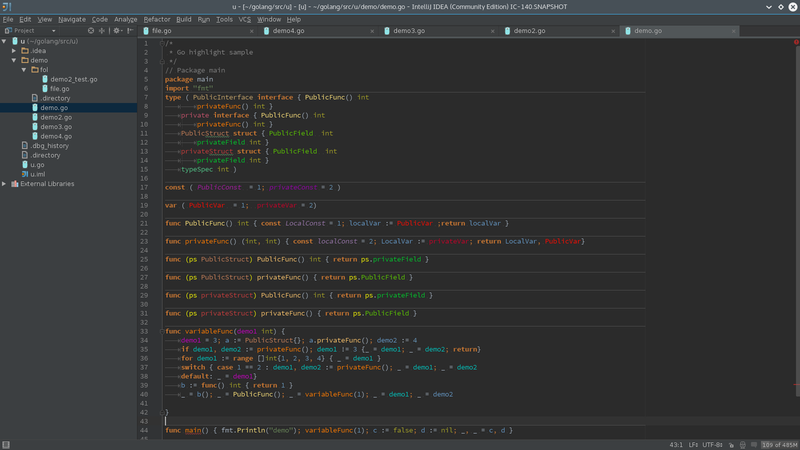 Currently there are a great deal of efforts to bring the plugin in line with what the users of IntelliJ platform expect from a professional plugin. There's a bunch of work to be done to get there but some very talented people help us, the community, to get there. The releases are currently labeled as alpha as they don't have all the functionality we'd like to have but it is already used by a lot of people in their day to day work. You can view the list of 1.0 issues as well as a list of possible issues to be included in the 1.0 release. A big Thank you! goes to Sergey (@ignatov) and Alexander (@zolotov) who are helping us quite a lot to bring this together as almost all you can see is their work in play, and also to our early adopters and people contributing to the plugin itself. I've started to write this after someone asked for some details on what's happening with the plugin and where is it going. To start with, there have been some major developments in 2014. Towards the end of the year, the master branch, aka 0.9.x received some major refactorings for the internals in order to fix some underlying issues that otherwise would have been next to impossible to fix. We've also got a major contribution in terms of a completely rewritten plugin for some friends of ours, which is now known as 1.0.0-alpha0 branch. Meanwhile, Mihai and me, both got stuck with availability issues, as we contribute to the plugin from our spare time. As you can imagine, that's very hard to do when there are many things in your personal life. So this is a major problem (maybe the biggest). The second major problem we have is that despite the huge interest in the plugin, and people willing to use it, we've only had 4 other guys helping us out with active code contributions during 2014. And we had them for at most 1-2 months. Maybe a big reason for people contributing to the plugin is that it's written in Java... Maybe it's because despite their best efforts, the documentation on how to do / solve different issues with the plugin framework provided by JetBrains, writing a language plugin is still a really really hard task. Fortunately, one way or the other, my availability issues will finish after 1st of March 2015 but still, there are many things I don't know how to do. Fortunately, both Sergey and Alexander will be there to help me out but when I get stuck, but working 3-4 hours / day at best won't come near to working 8+ hours / day on it. I'll start working on the 1.0.0-alpha0 branch, and port things from 0.9.x while working on the documentation for the steps I'm doing. I hope this would help others learn things faster. Definitely in 2015 we'll have a better Go plugin for IntelliJ IDEA and other IDEs while building the way to the best experience possible for go. If you are reading this and made it this far, and want to help, you can always start here: https://github.com/go-lang-plugin-org/go-lang-idea-plugin/blob/v1.0.0-alpha0/CONTRIBUTING.md It should provide all the information that you need to work on the plugin.